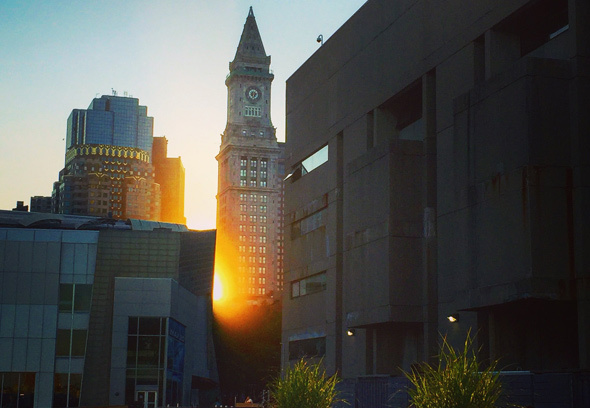 Molly Lanza watched the sun go down behind the Custom House this evening. Read more. Matt Frank looked skyward in a walk along Chelsea Creek at sunset. Read more. 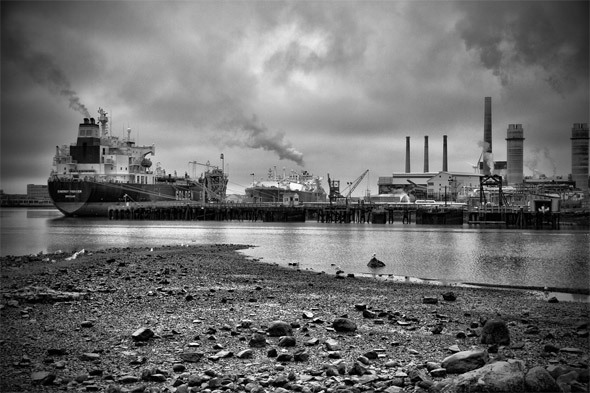 Roving UHub photographer Michael Campbell watched the Nor'easter roll up Chelsea Creek today. The ship, built in South Korea, owned by a Dutch company, and registered in the Marshall Islands, is an oil and chemicals tanker. It was originally scheduled to arrive last night. 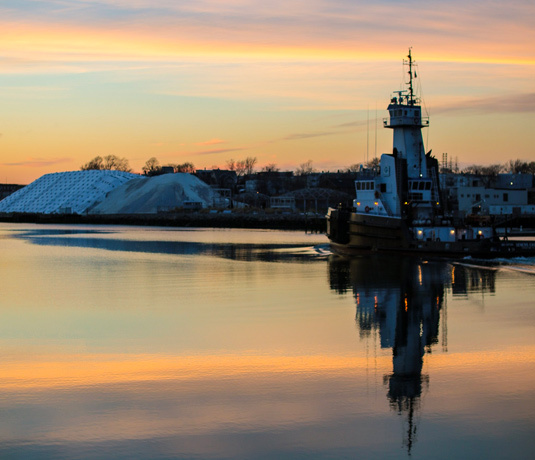 A body pulled from the Chelsea side of Chelsea Creek last night near the Meridian Street bridge was that of a 61-year-old man, the Suffolk County District Attorney's office reports. An initial investigation did not show signs of foul play, the DA's office says. 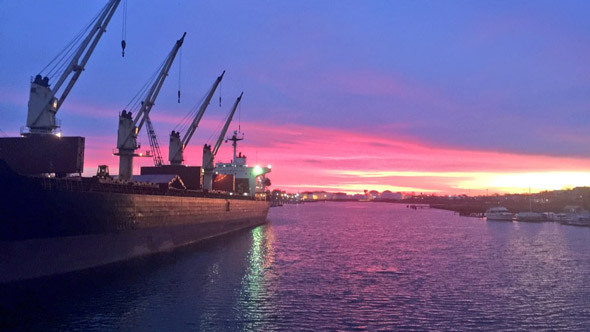 Matt Frank watched a salt ship unload in Chelsea Creek last night in preparation for the winter to come. Ryan caught the sunrise over Chelsea Creek. Read more. 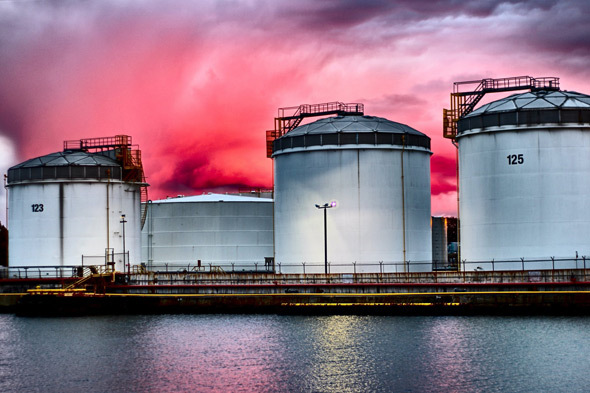 With the amazing sunset tonight, even the tanks along Chelsea Creek looked cool, as Matt Frank shows us. Ryan watched the sun come up this morning from the McArdle Bridge between East Boston and Chelsea. Boston Harbor is not yet completely ringed by luxury condos, as Chris Silverio shows us with this shot of the Chelsea waterfront. Copyright Chris Silverio. Posted in the Universal Hub pool on Flickr. 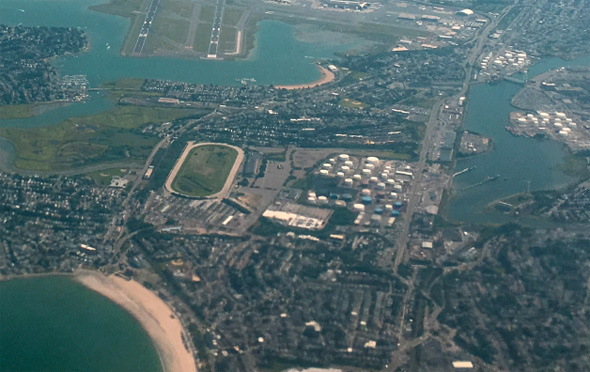 The Chelsea Record reports the Chelsea Conservation Commission rejected plans by Massport to store contaminated sludge from dredging near the Black Falcon Pier in South Boston in "Confined Aquatic Disposal Cells" in Chelsea Creek. 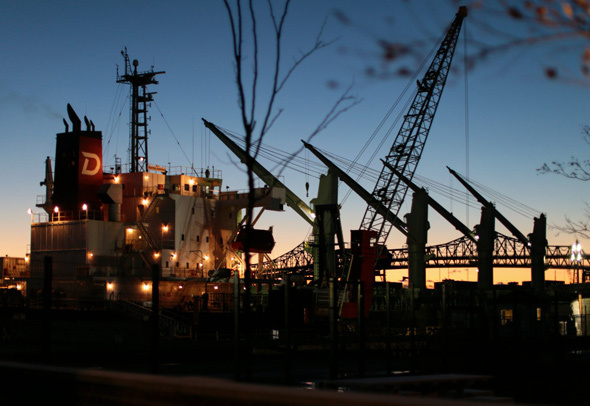 The commission said just because Massport did the same thing with sludge from the Conley Terminal doesn't mean Chelsea Creek can continue as the repository for the stuff. The Longfellow Bridge has its design challenges ahead, and the BU bridge has been no picnic for engineers. But another bridge in Boston – the Chelsea Street bridge between Chelsea and East Boston – is a simple affair. By the end of the summer, the new bridge, designed by HNTB and built by J.F. White of Framingham, may be complete. It may even happen ahead of schedule. Although the men working with iron above the river are having no trouble, the men who move mud below it have been facing a dozen daunting engineering tasks for over a year. They’re all trying to figure out how to make the channel for oil tankers wider. 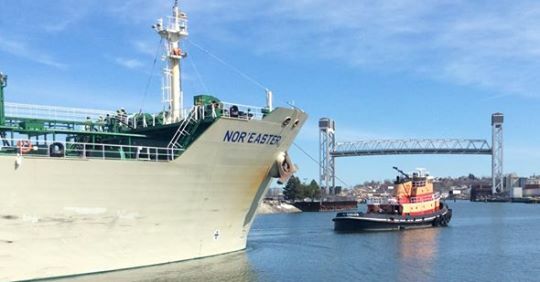 Engineers, pilots, tug captains, oil companies, private landowners, and Coast Guard and Army personnel have been at the drawing board for two years now. The new bridge, after all, will span the more than 200-ft. wide channel without interruption. That’s thanks to two superstructures that now dominate the Chelsea skyline (anyone can see them from the Tobin Bridge). So the bridge, when opened, might be wide enough to fit a “Panamax” oil tanker headed to the Gulf, Irving and Global tanks upstream. WBUR reports on the fate of $4.6 million settlement Exxon-Mobil paid in 2009 for dumping oil in Chelsea Creek. Basically, it could wind up not being used to help clean up the creek at all. The BRA is apparently part of the problem, as is the fact that the money was dumped into a federal fund aimed at preserving giant marshes for migratory birds. Jim snaps a shot of the Panagia Lady steaming up Chelsea Creek yesterday.